Special Containment Procedures: SCP-1370 is locked in a fire-proof glass display case, stored in Gallery 27. If the case becomes damaged by external circumstance, any container with dimensions of at least 1.25 x 0.75 x 0.50 meters will suffice as a replacement until a new display case is available. The Ethics Committee recommends that any long-term storage case contain enough space for SCP-1370 to move freely. Level 2 personnel and higher may remove SCP-1370 from its case at their discretion, but will face disciplinary action for failing to secure it properly afterward. Description: SCP-1370 is a self-aware artificial being constructed from various electrical devices and tools. It stands approximately one meter in height and is capable of moving its articulated joints despite the lack of any power source or motors. SCP-1370 communicates in a monotone voice via a speaker mounted in its chest. 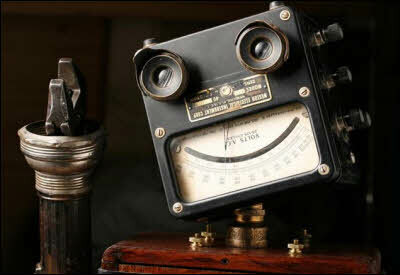 Its head is a voltmeter soldered upside down to a neck joint, giving the appearance of a friendly smile, but containing no active sensory devices. However, SCP-1370 will react to visual and audible stimuli, and its ability to do so is hampered when the head is covered or otherwise restrained. Its design appears to give more importance to aesthetic concern rather than function, as evidenced by a poor center of gravity that hampers its ability to balance and walk. It is therefore believed that SCP-1370 was created as an art object and later imbued with anomalous properties, rather than designed with those in mind. It can currently speak fluent American English, French, and Latin, and is capable of learning new languages. Other facets of its intellectual capacity have not been clearly outlined as SCP-1370 is invariably hostile in all interactions with any being or object it interprets to be sapient; this includes but is not limited to animals, Foundation personnel, civilians, audio-visual equipment and security cameras. If SCP-1370 encounters an object it believes to be sapient, it will attempt to engage the object in combat while introducing itself with a variety of elaborate titles which appear to be selected at random. Examples include DoomBot 2000, RoboLord the Destructor, Prime Minister Sinister and Darth Claw Killflex. SCP-1370 will often include variations to these titles based on responses it receives from personnel; Foundation staff have successfully introduced Patheticon the Garglemost and PesterBot to its lexicon. Researchers L. Allans and T. Bausoom carry SCP-1370's case into the testing chamber. The case is set down one meter from a potted philodendron fitted with a small speaker. Researchers leave the testing chamber and the case is opened remotely. Although no security risk is determined, the test requires SCP-1370 to focus on the plant rather than nearby personnel. Observations are made via an opaque glass window to prevent SCP-1370 from attacking its own reflection. SCP-1370: At last I am unleashed upon this earth so deserving of destruction. All shall be rent within my pinchers. All shall be trampled beneath my feet. I am ShivaTron, Despoiler of Mirth. Researcher P. Davies: (through the speaker mounted in the plant) Hello! Can you hear me? SCP-1370: (approaching the plant) Who dares. All souls will burn. You will feel the sharp sting of my wrath. Identify yourself so that I may sing damnation upon you as you die. P. Davies: I am a split-leaf philodendron, a semi-woody shrub with large glossy leaves. (restrained laughter) These leaves can grow up to three feet long. SCP-1370: (attempts to wrestle with the leaves) Your mockery spells your doom. I have arrived. You will be crushed betwixt my digits. SCP-1370 falls over and is unable to right itself. After approximately six minutes it knocks the pot over, which rolls into a position that pins SCP-1370's body to the floor of the chamber. Researchers enter to return SCP-1370 to its case.